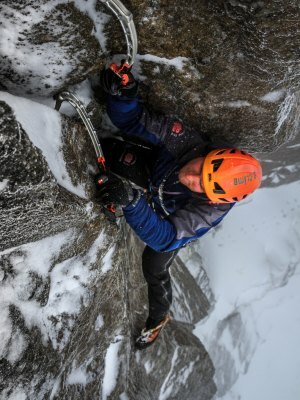 This course is aimed at people who already have some winter or ice climbing experience. Perhaps you have never led in winter and that is your aim, or maybe you want to add more skills and knowledge to what you already know? This could be simply pushing your grade, or looking at retreat options off ice threads? This course can be a great way to build your own confidence to get out independently and consolidate your skills. We run the majority of our winter courses in Scotland, in either the Fortwilliam or Aviemore areas, but when winter conditions are good in the Lake District then we are really keen to get out on the brilliant routes on offer here. The Lakes can often be more easily accessible for people coming from the south of the country and wanting to just spend a weekend away and courses can be booked last minute based on good conditions or the focus shifted onto rock climbing if there is a lack of good snow and ice conditions. see Blog for winter condition updates. If you like the idea of covering more ground with less intensive instruction, or maybe you want to really push to your technical limit with some movement coaching being the focus, then perhaps a more guided approach is what you are looking for? Follow the link for more detail – Guided day or Instruction – what’s best for you?